Jenny and I are in Houston for another surgery. 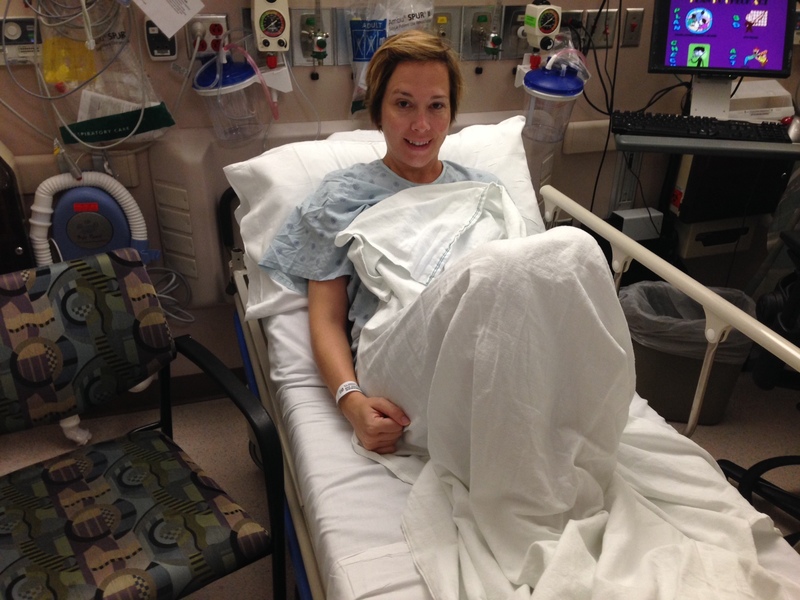 If you missed her pre-surgery post, you can read it here. This surgery should be the last time they need to open her up. We hope we are done with No. 6. With this surgery, they are swapping out the expander they had in place after the surgery in Feb. They are also doing fat grafting on each side to complete the process and make sure the implants are surrounded by tissue. We think this is the last surgery, but the doctors say they often will do more fat grafting in months/years to come as everything settles into place. They call it serial grafting. It’s a thing. All that is up to Jenny. Today, the plan was to have the surgery, recover and go back to the hotel. We will not be staying overnight. The timeline is below, but here’s the spoiler: She’s good. A longer day than expected, but she’s good. 5:55 a.m.: We leave the hotel room for the 10-minute drive to MD Anderson. We prefer the early morning surgeries. And since the patient can’t eat or drink after midnight, early morning surgeries are a necessity for Jenny. We all know what she’s like when she’s hungry. 6:12 a.m.: We check in for surgery. As always, it’s the one area of the massive hospital that’s bustling at 6 in the morning. 6:18 a.m.: As Jenny fills out her paperwork, a man is finished with his paperwork and has been assigned to a pre-op bed. Probably in his 80s or even beyond, he wasn’t moving too fast, but he was already out of his seat and well ahead of his wife. As she shuffled past us, annoyed at his quicker pace, she hollered up to him, “I tell you, they’re not going to start it without you!” Jenny chuckles. So does everyone in the waiting room. 6:25 p.m.: Jenny is called back to the pre-op bed. We know the drill. She’s confident. She’s not nervous at all. She’s ready to be finished with these. No tears. I even offer to help her escape and spend the day back down in Galveston. She said, no. She’s come this far. She’s going to finish this. Jenny waits for surgery No. 6. 6:57 a.m.: Jenny’s parents arrive. Bill and Linda take turns visiting Jenny. Again, we know the drill. I see Dr. Kronowitz’s PA, Katie, walk by the waiting area. Jenny likes her a lot. I know she’s on her way to see Jenny, so I know things are picking up. 7:32 a.m.: I go back and wait with Jenny. She is awaiting the anesthesiologist, but she’s still in great spirits. It’s not much longer until the anesthesiology nurse arrives. She starts the process. When the anesthesiologist steps in, she kindly scolds me for having a cup of coffee. Apparently, I broke a rule. I don’t like breaking rules. We’re living in a society, after all. 8 a.m.: The anesthesiologist says it’s time for hugs and kisses (she meant between Jenny and me) because Jenny is about to be loopy with medicine. And with that — and after the obligatory joke to the doctors about Jenny feeling loopy — we depart. Bill, Linda and I make our way to the second-floor waiting area amidst the construction at MD Anderson. 8:49 a.m.: Surgery actually begins. We didn’t get that update until about 9:30 a.m., but that’s what the volunteer sees on the official logs. It’s supposed to be a 2- to 3-hour surgery, but the anesthesiologist said it was scheduled for four hours. We shall see. 8:55 a.m.: Linda picks up a Houston Chronicle newspaper. I offer to let her read The Oklahoman on my iPad. I’ve written about her before on my blog on NewsOK.com — she’s our best subscriber. That sparks a conversation about how she just prefers to read the printed newspaper. Bill says he’s lost his password to access The Oklahoman on his phone. I can help with that, so I reset the password for him. Then I helped him through the process to log in. It took a couple minutes, but by 9:05 a.m., he was reading The Oklahoman on the iPhone app. Another satisfied customer. 9:45 a.m.: The volunteer in the waiting room shared with Bill and Linda that she also had a double mastectomy and that the surgery Jenny is having is a piece of cake compared to her previous surgeries. That confirms what we’ve heard and understood — but it’s just another example of how many people this disease touches. It just seems to be everywhere, which is why I encourage Jenny to keep blogging even as we put the regular treatments behind us. 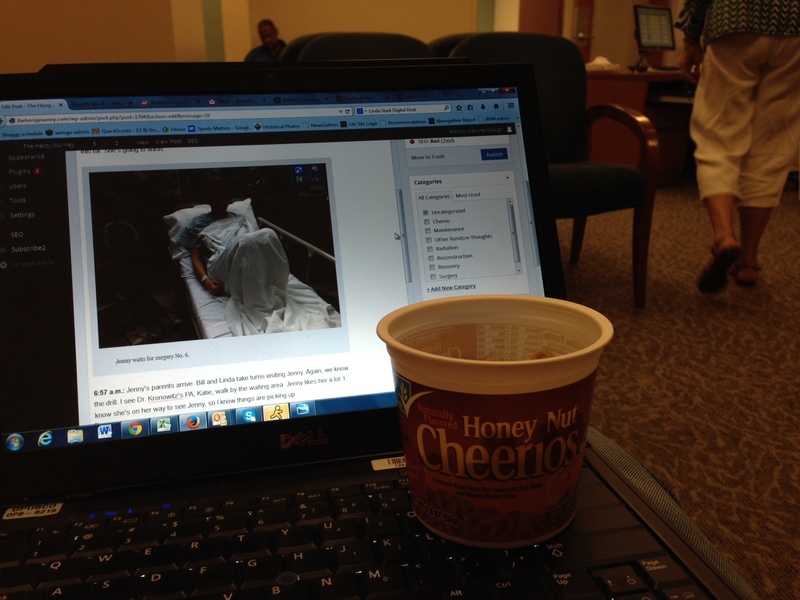 Newly diagnosed cancer patients need to find more blogs that end in a normal life. Jenny was reading everything she could find after she was diagnosed two years ago. And she started the blog to help update family and friends on her progress. At times, it’s become much more than that, though. Her blog posts and her connections have already helped many others, just as others’ experiences had helped her and continue to help her. This blog should continue in the years to come — even if the posts are far less frequent. Make a note. Bug her about adding another post every couple of months. 10 a.m.: This is what it looks like in the waiting area. I pass the time on this very blog post. Breakfast of champions. Don’t worry, there was no milk in the cereal cup. 10:45 a.m.: The woman at the next table in the waiting room makes her fifth phone call to a friend about the difficult puzzle in the paper this morning. It’s a tough one. I know because it’s the fifth phone call about it. Her daughter is here for a melanoma surgery. Her husband snoozes. She has her puzzle. It’s a tough one today. I know because she promised to make a sixth phone call to her friend if she figured something out. I’m just glad she has a newspaper. 10:55 a.m.: A nurse gives us an update. She remembers updating me for a previous surgery. That was in February. We must be memorable. She says they were working on fat grafting on Jenny at 9:30 a.m. and that they will need to flip her over to work on swapping out the expander. She expects that they will be done between noon and 1 p.m. Perfect. There’s enough time to go grab a sandwich. 11:20 a.m.: There wasn’t enough time to grab a sandwich. I missed Dr. Kronowitz. He finished and came down to talk to us. Luckily, Bill and Linda were here. He reported that the surgery was finished and he was off to the next surgery. He thinks Jenny will be happy with the results in a few months, but to make sure we tell her that there will be swelling and that the fat grafting will settle in over time. He’s given that speech to us before. He says he’s gotten many calls from hospital rooms from upset patients that think he botched a surgery. I guess he wants gravity to help with his final product. Katie was still in the surgery room stitching Jenny up. We’ll get to see Jenny within the next couple hours. 11:58 a.m.: Jenny is wheeled out of the operating room. We learned this at 12:15 p.m. I love the details they share with patients’ families. 1:05 p.m.: The nice volunteer woman gets a phone call and tells us that we can go see Jenny. She walks Linda and me to the fifth floor to the post-op area. Jenny’s not awake, but she responds and smiles. Her first question when finding out that it’s after 1? “Did you eat?” I had, of course, but I lied and told her that I was waiting for her. She said she’d whip something up when we got back to the hotel room. 3 p.m.: The nurses had already signed the discharge papers and are about to have Jenny change clothes, use the restroom and get going, but her oxygen levels weren’t high enough for one of the other nurses. It actually worried her. She put Jenny back on oxygen, asked a lot of questions and said we might have to stay the night. Thus became the dilemma in the post-op area. They were low on space. They needed more patients to be discharged. Jenny was one they expected to get out at about this time, but her recovery speed after anesthesia wasn’t cooperating. 3:45 p.m.: Jenny is really, really sleepy. They want her to be more awake, but some of the meds they gave her after surgery weren’t helping. They remove the oxygen mask, and Jenny’s oxygen levels continue to improve even while sleeping. This is a good sign. 4:50 p.m.: By this point, they are just waiting for Jenny to prove her bladder will work properly. Jenny fails twice. I leave for a moment on my own restroom break. In the waiting room is the woman who was scolding her speedy husband at 6:30 a.m. She’s getting news from her husband’s doctor. She’s smiling. And she has more family around her than she did at the beginning. It was a nice scene. 5:25 p.m.: Jenny tries the restroom for a third time. She fails … again. But it wasn’t for a lack of wishing. Three nurses were all around chatting it up. But every third question was about the status of Jenny’s bladder. It was clear that they were rooting for Jenny to just let it flow. She had a Diet Coke, two cups of apple juice, four cups of water and IV fluids. But the third try was another failure. 5:45 p.m.: The nurses get word from Dr. Kronowitz’s team that she can be discharged. She wasn’t a big risk for a bladder infection. And it was clear that they needed the bed. She was discharged. 6 p.m.: The wheelchair arrives. She’s free. 7 p.m.: After eating a salad for dinner, Jenny’s bladder accomplishes the day’s mission. Now, she can rest without nurses hovering over her. She’s in a lot of pain if she moves. But compared to her previous surgery, she’s feeling much better. More than anything, she’s extremely tired. A moment ago while finding something on TV, she said, “I just fell asleep for a minute in mid channel flip.” She’s tired, so I’ll let her sleep and watch the MLS All-Star game vs. Bayern Munich tonight. She’ll be disappointed, but I’ll tell her all about it. 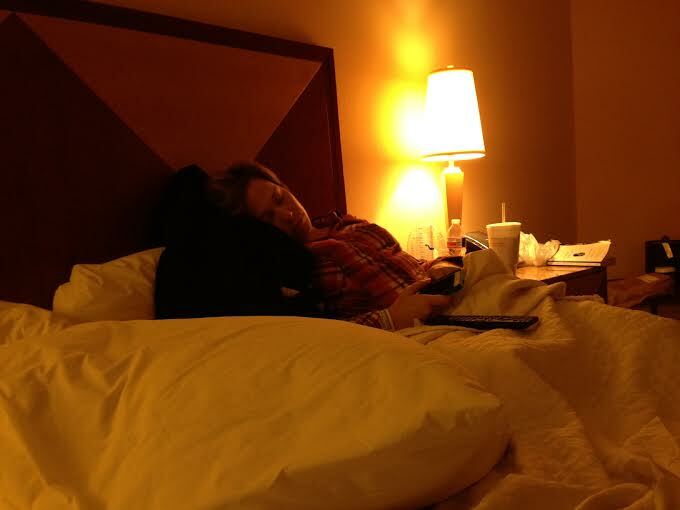 Note the phone still in Jenny’s hand as she sleeps. We will have a follow-up appointment with Dr. Kronowitz on Thursday afternoon before driving back to Edmond. We expect to be home at 10 or 11 p.m. Thursday night. Thanks for the updates on Jenny today. So glad she got through it and didn’t have to stay in the hospital for the night. I know you’re taking good care of her but we’re all still sending good thoughts your way! Be safe on the ride home. You and Jenny are both excellent bloggers, Alan. I feel like I was there, which is nice considering it kills me to be so far away. I wish I could have been in the waiting room with you. So glad it’s over. Be safe coming home. Much love!!! What a fantastic update. So happy she has this behind her. I bet that diet coke was the problem, they should have diet Pepsi! Another great post, Alan. Thank you and yay, Jenny! She’s so beautiful! Thanks Alan. I appreciate too the detail. Just as Keri said, it makes me feel like I was there. Wish we could have been there. Have a safe trip home. Thanks for the thorough update, Alan. I appreciate the details 🙂 Praying for a speedy recovery and a safe trip home! These updates are great! I’m glad she is doing okay. Keep your head up, Jenny!